Biography of Dutch Landscape Painter, noted for The Jewish Cemetery. The painter and etcher Jacob Isaacksz van Ruisdael is widely regarded as Holland's greatest exponent of landscape painting during the era of Dutch Baroque art (1580-1680). Born in Haarlem, the son of the framemaker, art dealer and landscape painter Isaak van Ruisdael, he may have studied under his father, and perhaps also with his uncle Salomon van Ruysdael (1600-70) - who influenced his early pictures - as well as with Allart van Everdingen (1621-75) the Dutch marine and landscape painter. In 1648, he became a member of the artists guild of St Luke in Haarlem, while in 1659 he obtained the freedom of the city of Amsterdam for his services to art. Unlike many leading figures in 17th century Dutch painting who were active in portraiture and Dutch Realist genre-painting, Ruisdael was competing against the popularity of idyllic Italianate landscapes by Nicolas Poussin (1594-1665) and Claude Lorrain (1604-82). As a result, despite now being considered as one of the best landscape artists of his age, his works were so little appreciated during his lifetime, that in 1681 the Mennonite sect with whom he was connected, petitioned the council of Haarlem for his admission into the almshouse of the town, where he died the following year. Jacob Van Ruisdael along with Salomon van Ruysdael (1603-70), Meindert Hobbema (1638-1709), and Aelbert Cuyp (1620-90), were four highly important painters who between them strongly influenced the development of the English School of Landscape Painting in the next century. But there were two styles. The first - a continuation of the classical tradition popularized by Claude Lorrain - produced ideal-landscapes, often depicting scenes of the Italian countryside, real or imagined. The second, the native Dutch Realist style sprang directly from nature, which was depicted with great fidelity. 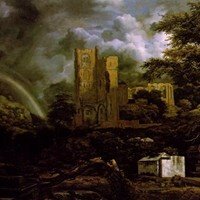 In Ruisdael's lifetime, the classical style was more appreciated by patrons and thus more profitable. He was very precocious: the earliest dated works, views in the neighborhood of Haarlem done when he was not yet 20, show astonishing maturity, particularly in their contrasts of light and shadow and their vivid colour. Around 1650 Ruisdael visited east Holland and the regions of Germany that adjoined the Dutch border - hilly, forested areas which excited the romantic strain in him. He lived in Amsterdam from 1657 until his death, although he continued to travel about Holland. Between 1650 and 1670 he tackled almost every kind of landscape: panoramas painted from the dunes overlooking the vast fertile plain around Haarlem, woodland scenes and the denser recesses of forests, country roads bordered by cottages and wheatfields, river scenes centered on picturesque watermills, stormy seascapes, calmer beach scenes, and pictures of villages in winter. From 1659, Ruisdael also painted a series of views of mountain streams and waterfalls inspired by the Scandinavian landscapes of Allart van Everdingen (1621-75). Ruisdael's oil painting is characterized by a sensitive response to the different moods of nature, whether in the elevating experience of vast, luminous panoramas of green meadows and golden wheatfields, or the image of dark, desolate winter scenes. The principal vehicle for the expression of mood in his landscapes is light and shade, particularly such dramatic and arresting devices as the fitful breaking of sunlight through massive clouds. Absence of light is also evocative, as in the melancholy forest interiors with their dead trees and stagnant pools. Many of Ruisdael's views are still recognizable, but he is not always a realist. The conjunction of observation and imagination is illustrated by the two versions of The Jewish Cemetery at Ouderkerk (Gemaldegalerie Alte Meister, Dresden, and the Detroit Institute of Arts). In these paintings fictional mountains and ruins surround tombstones sketched at Ouderkerk, near Amsterdam. A degree of subjectivity is elsewhere evident in Ruisdael's majestic and powerful conception of nature - a conception conveyed by giant oaks, foaming mountain torrents, and distant horizons. The question of realism is also complicated by occasional allusions to cyclical processes of decay, growth, and renewal. These are not necessarily of an explicitly allegorical kind. They are particularly evident in the Jewish Cemetery paintings, where a rainbow and new foliage are contrasted with such symbols of the transitoriness of life as tombs, ruins, and dead trees. The prevailing colour of his landscape palette is a rich green, which has alas darkened over time, while his marine pictures have a characteristic clear grey tone. Figures are included only sparingly, and some are believed to derive from drawings by the short-lived Adriaen van de Velde (1636-72), and Philip Wouwerman (1619-68). Unlike the other great Dutch landscape painters, Ruisdael did not aim at a pictorial record of particular scenes, but he carefully thought out and arranged his compositions, introducing into them an infinite variety of subtle contrasts in the formation of the clouds, the plants and tree forms, and the play of light. He particularly excelled in the painting of cloudscapes which are spanned dome-like over the landscape, and determine the light and shade of the objects. During his later years he drew his inspiration from other masters, instead of going to nature direct. For example, his favourite scenes featured river torrents and waterfalls, and ruined castles on mountain tops, which are taken from the Swiss views by Roghmau. For another renowned artist from Haarlem, see the precise architectural painter: Pieter Saenredam (1597-1665). Although his influence on other Dutch artists, notably his pupil and friend Meyndert Hobbema (1638-1709), was considerable, Ruisdael was much less popular in his lifetime than the painters of Italianate landscapes. There were many appreciative collectors of his work during the 18th century; but his importance was only fully recognized during the Romantic period, with the subsequent rise of naturalistic landscape in England and France during the first half of the 19th century. He is now considered to be one of the greatest Old Masters of the 17th century. The best collection of Ruisdael prints is in the Rijksmuseum, exemplified by The Cornfield and the Travellers which are among the finest examples of landscape printmaking of the 17th century.